"My favorite skincare products are…When I’m feeling super fancy I like to use skincare products from 3LAB. They have this cream that changed my skin! It’s called WW Cream, it’s expensive but I justify my purchase because it lasts me a long time. 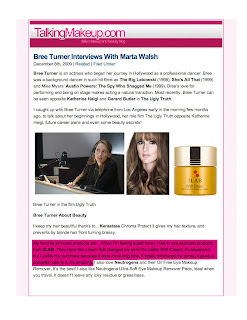 It totally minimized my pores, it gives a porcelain look to it, it’s amazing..."
Bree, we're so glad that you like our WW Cream. That really means a lot. Thanks so much Marta for the AMAZING interview!